A few weeks back, we promised to bring you more on the latest album from Grady Champion. With the new year now just mere hours away, we couldn’t think of a better note on which to end 2014 than a closer look at this one, the diversity and soulfulness of which help rank it among our favorite new releases of the year. 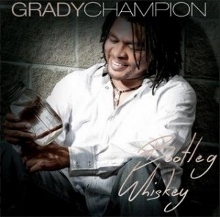 The latest release from 2010 International Blues Challenge winner Grady Champion is also the Mississippi bluesman’s debut on the storied Malaco Records label. So it may not come as much of a surprise to those familiar with the label – which previously served as home to the likes of Bobby “Blue” Bland, Z.Z. Hill, Johnnie Taylor, Tyrone Davis, Dorothy Moore, and Little Milton – that Champion’s Bootleg Whiskey contains its own fair share of smooth soul, from the late George Jackson-penned swaying title track that speaks of “bootleg whiskey and a cheap motel, wit’ a lil’ ol’ ugly girl” to the “Amazing Grace”-inspired closer “White Boy with the Blues”, often buoyed by some rich horns and background vocals. But the truth is that you’ll find plenty of other good stuff as well, starting with the hard-driving old time swing sound of the opening “Beg, Borrow, Steal” a la The Nighthawks with its gritty guitar and harmonica and strong backing vocals. “Don’t Waste My Time” is a tough, horn-soaked slow blues number that features some particularly sandpapery vocals from Champion as he growls out such lines as “you know we were asleep the other night, you called me Bobby Rush, and you know, Grady Champion is my name”, with other standout tracks including the gritty creeper “Who Dat”, with its haunting chorus and powerful backing vocals, and the Mississippi Hill Country-style romp “Here We Go Ya’ll”. Also mixed in is an impressive assortment of mid-tempo soul/blues tunes such as “Home Alone”, “Ten Dollars” and “I Tripped and Fell in Love” that allow Champion to show his stuff vocally as well as musically. Indeed, the album is a good deal more refined than its name might imply, with Champion’s talented vocals, songwriting, and harmonica work helping to give the project just the right amount of bite to ensure that it never really comes across as too smooth. If you’re looking for some good blues to help close out your 2014 or ring in the new year, Bootleg Whiskey is as solid a choice as any. If time doesn’t allow you to pick up a copy before the much anticipated midnight hour, you’re going to want to resolve yourself to adding Bootleg Whiskey to your collection just as soon as you can in 2015; it will be one of the quickest – and perhaps most fulfilling – New Year’s resolutions you can make. Wishing you and yours a happy, healthy and blues-filled 2015! This entry was posted in Albums and tagged Grady Champion. Bookmark the permalink.